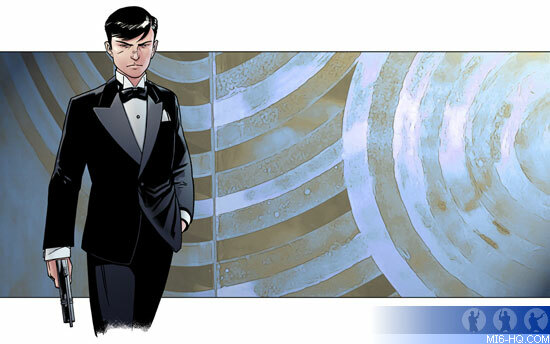 Plot: James Bond travels to LA. 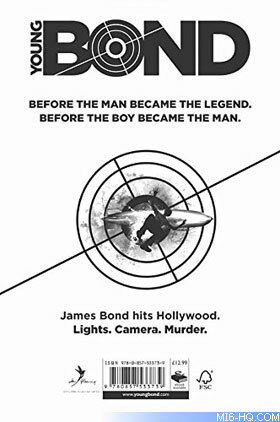 Before leaving, a new school friend discovers some shocking film footage which propels Bond and company on an adventure. Highlights: Roof top escape from Darlington Hall. Car chase through the sprawling streets of LA with James behind the wheel. Above: First edition UK hardback. Above: Back cover of the first edition. Steve Cole comments "I am both honoured and hugely excited to be taking on Young Bond from Charlie. I am having a fantastic time shaping a new era in the life of a truly iconic character - readers can expect many firsts, surprises and dangers to come as James's life develops." Steve Cole and the first Young Bond author Charlie Higson came together at the Hay Festival to mark the official handover of the authorship. 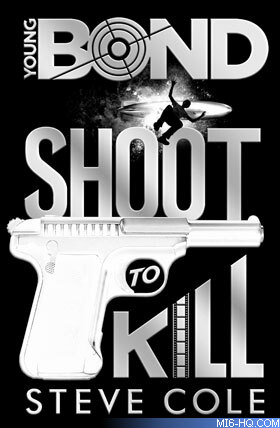 Together they unveiled a giant replica book cover of Shoot to Kill, a striking black and metallic design which gives a few hints as to what will unfold in Bond’s next adventure. Handing over the reins to Steve Cole, Charlie Higson comments, "As a lifelong Bond fan, having the opportunity to write five Young Bond books and bring the most famous secret agent in the world to life for a younger generation was a total blast. Being a part of the James Bond legacy, and being allowed to play in his world, was a real honour and I know only too well what excitement is in store for Steve as he begins a new chapter for Young Bond."